At Summit Riverside, we’re happy to offer the best apartments for rent in Littleton. With plenty of amazing amenities, they’re great for anyone looking to be close to the Platte River bike trail, Littleton’s best shopping, or some really incredible restaurants. Whatever your hobbies, you’re sure to appreciate life at our apartment complex! As you probably know, living in an apartment means that you have to choose your furniture wisely. After all, you can’t just have three cozy couches in the living room. In other words, you want to maximize the number of places you have to lounge without taking up every square inch of space in your apartment. What’s a person to do? Thankfully, our team knows these apartments inside and out, and we’ve put together a list of the furniture that we think will really help to make your space usable and functional. What will make the cut? Keep reading to find out! You don’t want to have to break out the tv tray every single time you need to set down a beverage, but unfortunately, that’s what happens in a number of apartments. Our advice is to invest in a couple of side tables for your living room. 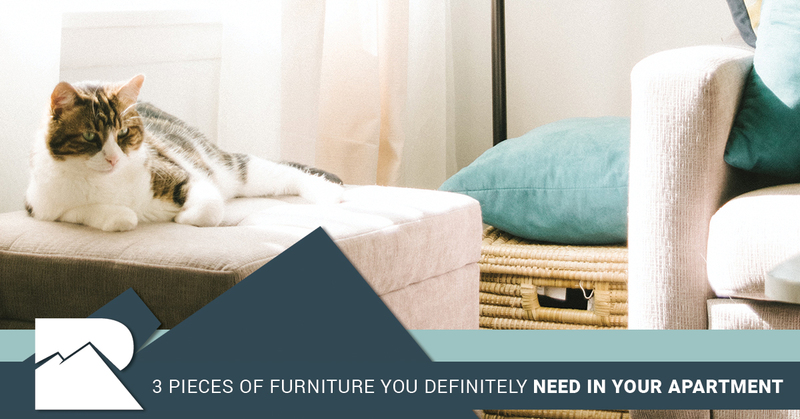 If you don’t already have one, you’ll be amazed at how much use you can get out of a side table. Need some extra light next to your couch so you can cozy up and dig into a book? A side table is the perfect place for a lamp. Looking for a way to add a bit of easy style to your apartment? A few intentionally chosen magazines or coffee table books spread out on the side table makes an impact without much work. At the end of the day, how you use your side tables is entirely up to you, but trust us when we say that having them available can make all the difference in the world. What’s an occasional chair, you ask? Wikipedia sums it up wonderfully: “Occasional furniture refers to small pieces of furniture that can be put to varied uses as the occasion demands.” In other words, an occasional chair can be used however you need it to be used in your living space. For example, if you live in a floor plan like the Gunnison or the Colorado, you’ll have a nice, spacious living room, and also a dining room. An occasional chair can be set up most of the time in your living room. Most of the time, you can adorn it with a decorative pop like a blanket or a throw pillow. When you have guests over, they have a place to sit! Are you hosting a dinner party for six people but only have four chairs? Take advantage of your occasional chairs! As you can tell, life in an apartment means that you’ll need pieces that can pull double duty. What better piece of furniture to add to your living space than an ottoman? Need a place to set your plate while you’re eating breakfast in the morning? Want to kick back at the end of a long day and put your feet up while you lounge on the couch and watch a movie? Have to store the giant blanket that you usually use while you’re lounging on the couch? An ottoman is the perfect solution. Available in a number of sizes, styles, and colors, ottomans are a great way to add some fashionable function to any living room. By combining storage and usefulness, they’re a perfect option for all types of living spaces. At Summit Riverside Apartments in Littleton, our goal is to help you create a living space that you’ll actually really enjoy spending your time in. There’s a lot to love about life in Colorado, and the good news is that there’s plenty to do in our neck of the woods. Whether it’s visiting nearby restaurants like The Pint Room or Wayback Burgers, or staying in and enjoying your apartment’s stainless steel appliances, designer flooring, berber carpet, patio or balcony, or wood-burning fireplace, you’re sure to appreciate life at Summit Riverside Apartments. Other amenities include nearby bike trails, a new clubhouse, 24-hour fitness center, outdoor heated saltwater pool, full-size basketball court, playground, and more. We’re also happy to say that we offer pet-friendly apartments which means that your dogs or cats are welcome here! We’re even planning to open a new onsite bark park in the very near future for your pups to play in. It doesn’t get much better than that. Why not come by and take a look for yourself? Schedule a tour today or apply now. Either way, we look forward to meeting you and we think you’ll be thrilled to live here.